A friend and I were visiting the other day and trying to decide exactly what you would call our obsession with saving scraps and bits. The term “junk collector” isn’t really fitting and sounds so cold. We are more like “gatherers”. We like to gather and save all kinds of intriguing things, big and small, until we discover or create a way to use them. With a husband in the scrap business, I may get to do more gathering than most, but I really enjoy the challenge of creating with my finds. 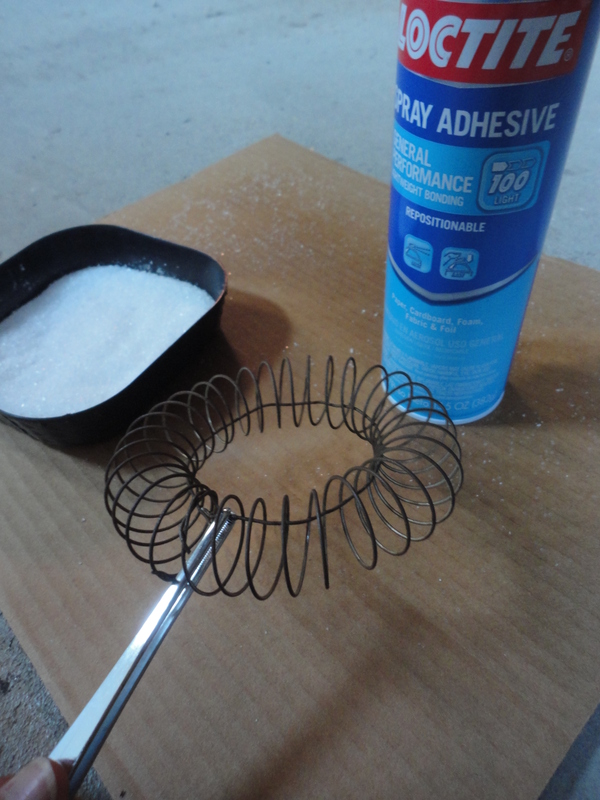 After pinning another great Pinterest post on crafting with Epsom Salt, I figured it was time to give it a try. But, what was I going to put it on? During short breaks from glass work the last couple of weeks, I’ve been having fun rusting wire, bells, and a few other tidbits. Looking through them. I found a couple large notebook spirals that rusted nicely, and thought they would look good as flocked wreath ornaments. 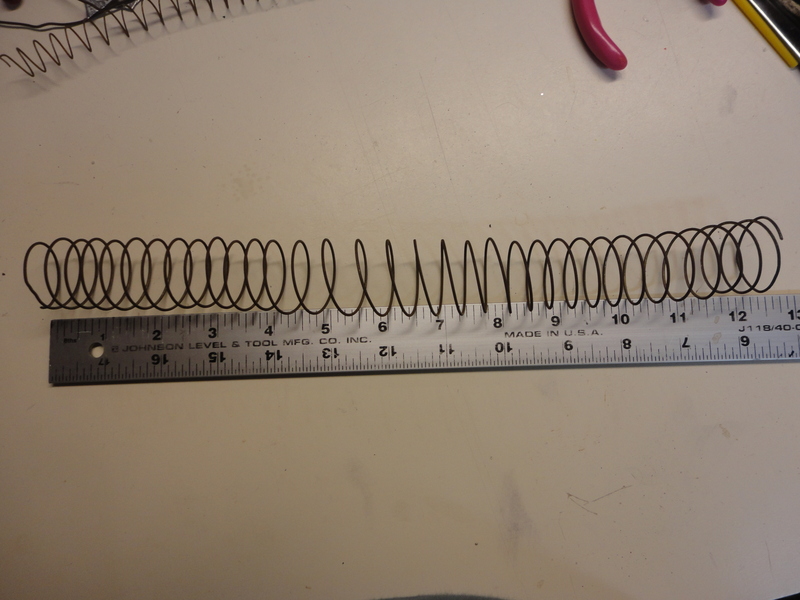 I started with a large rusted spiral approximately 12″ long. Shape in a circle and clip ends together to determine the diameter of the wire circle you will need for an inner circle, to prevent sagging. 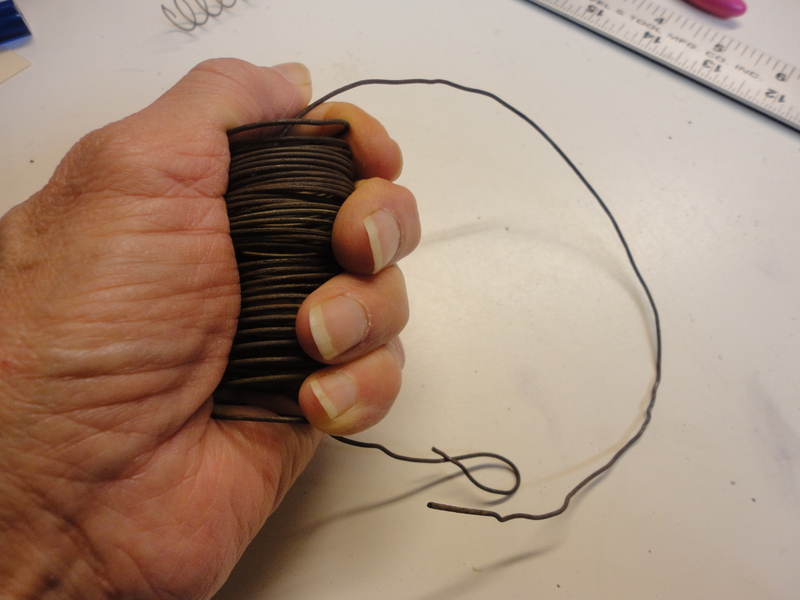 Pre-shape a length of rusty wire into the circle size needed, with a little extra on the ends. 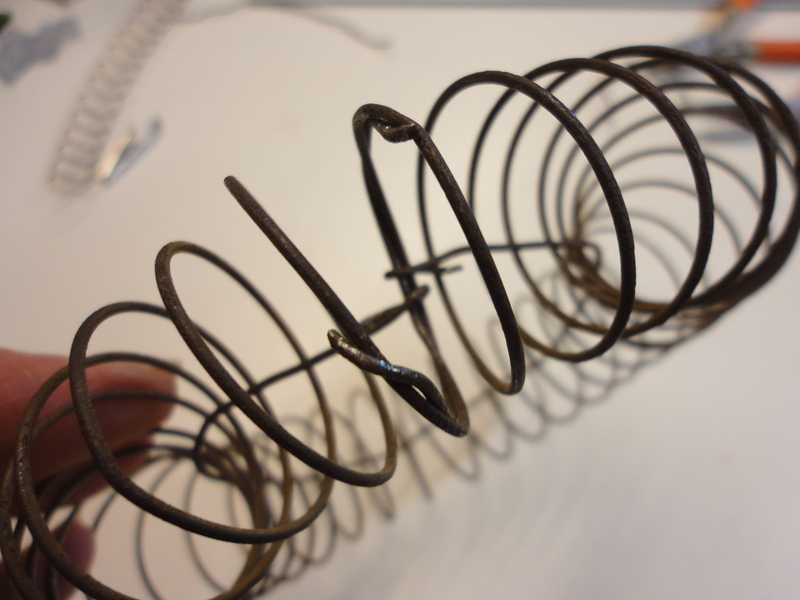 Scrunch the spiral in your hand and thread wire through. 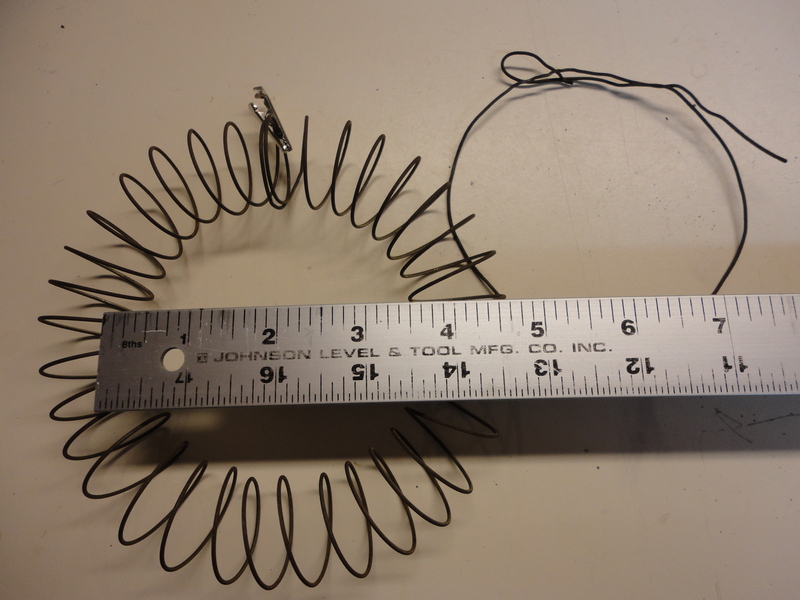 Trim off excess wire and form small hooks on wire ends. Cross hooks over and connect the spiral together to form the inner circle. Pinch hooks tight. 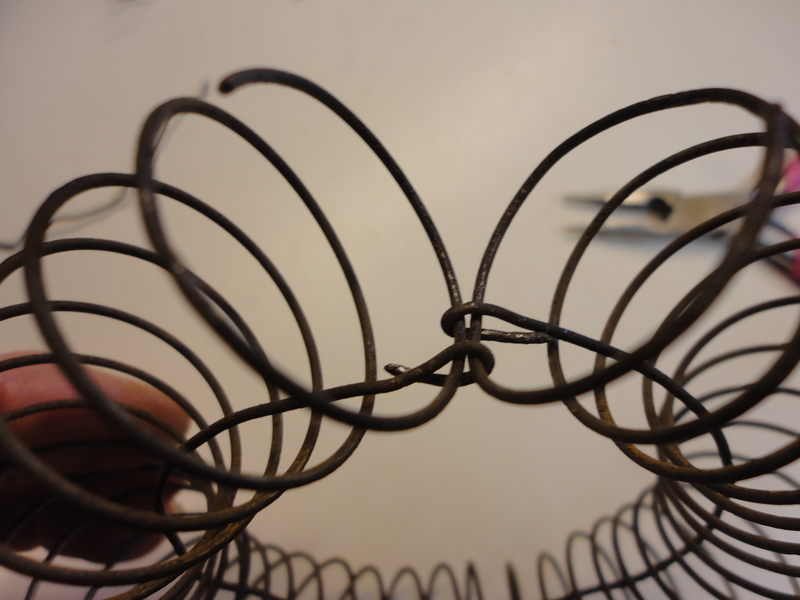 Wrap the loose coil ends of the spiral to the coil opposite of it (right to left, left to right) to complete the outside edge of the circle. Not wanting fumes to choke everyone out of the house, I moved to the garage for spraying and coating my wreaths. 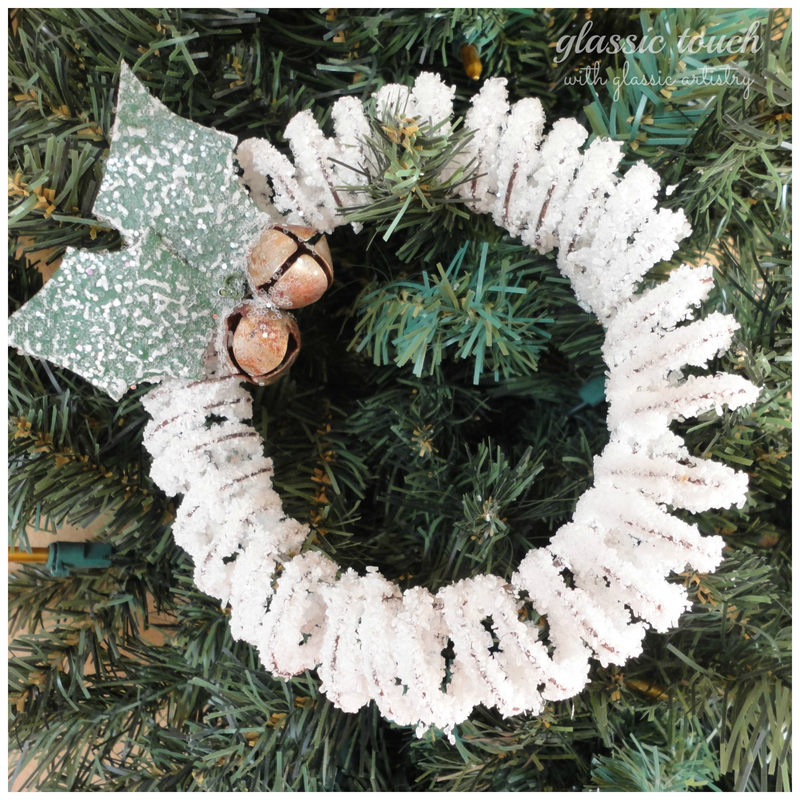 Using long tweezers to hold the wreaths worked like a charm, and they cleaned up easily with a wipe of mineral spirits. Spraying over the garbage bin kept sticky overspray residue at bay. Adhesive sprays may differ; please follow manufacturers directions. 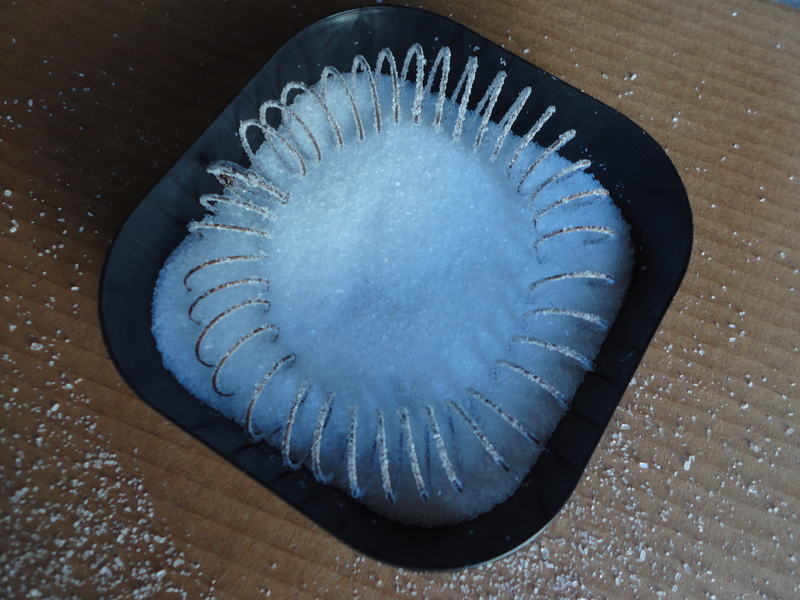 After spraying, coat wreath well in a shallow container of Epsom Salt. 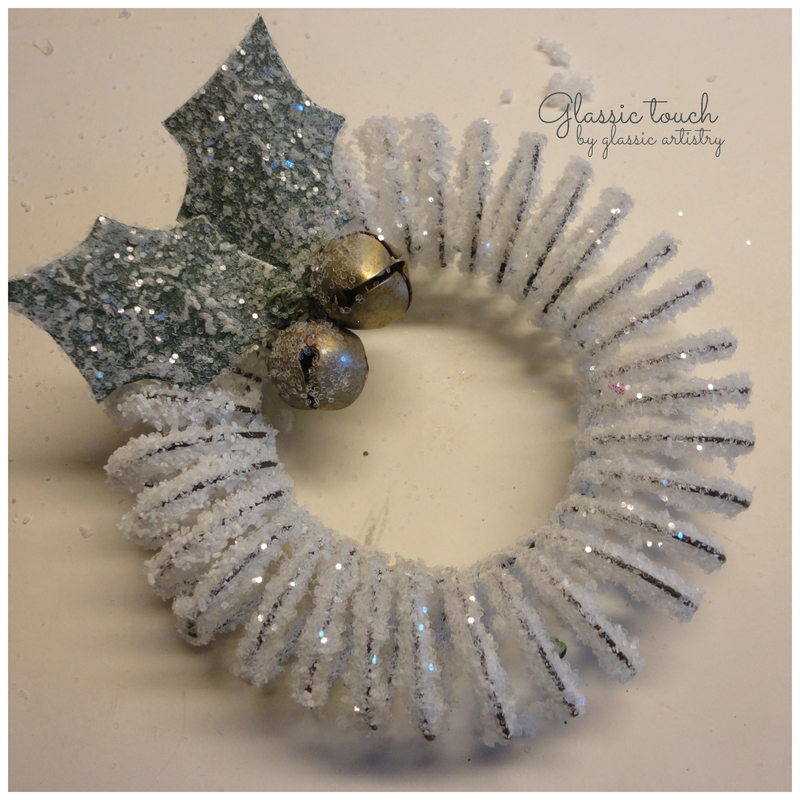 I waited about 10 minutes, then sprayed the wreath again, before sprinkling it with crystal clear glitter. You can stop here if you like the look. Wanting a heavier, fuller appearance, I waited about 20 minutes and repeated the coating step. Then moved the wreaths inside to dry thoroughly. 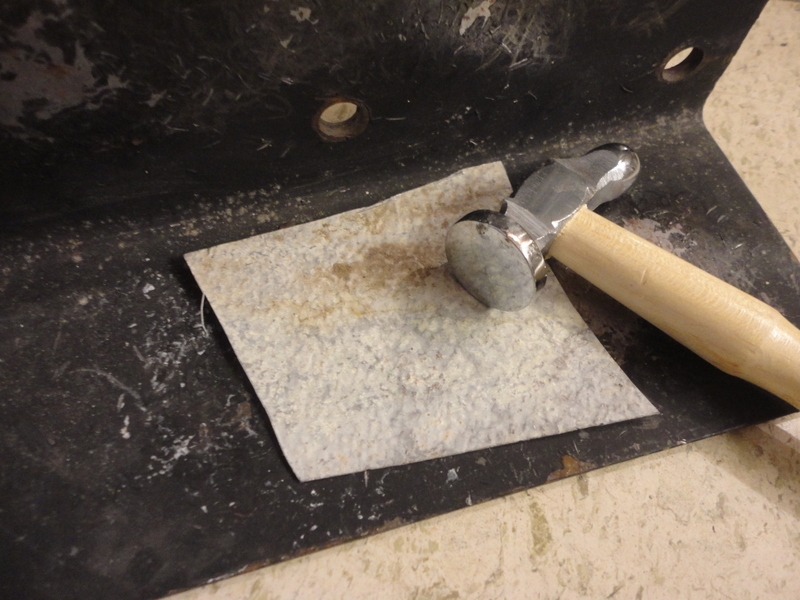 Flatten a small piece of textured scrap aluminum for the holly. 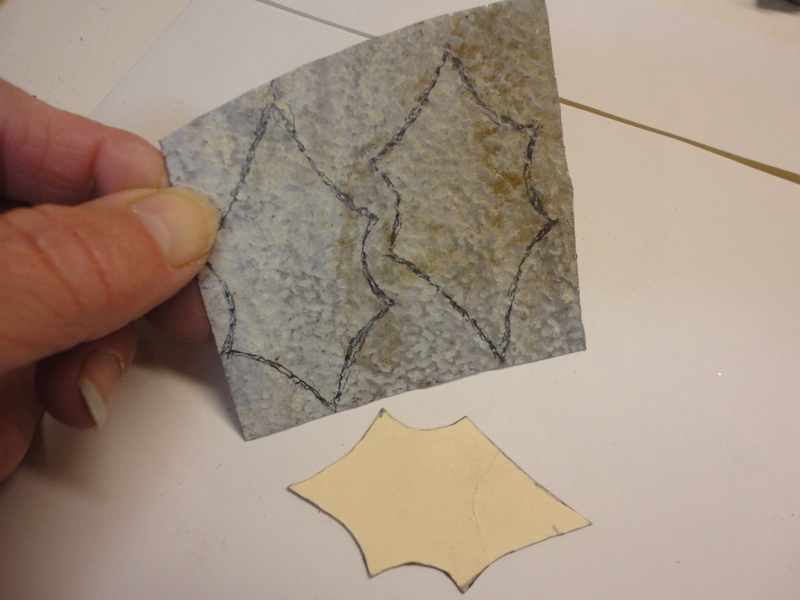 Trace first leaf, then flip the pattern before tracing the second leaf. 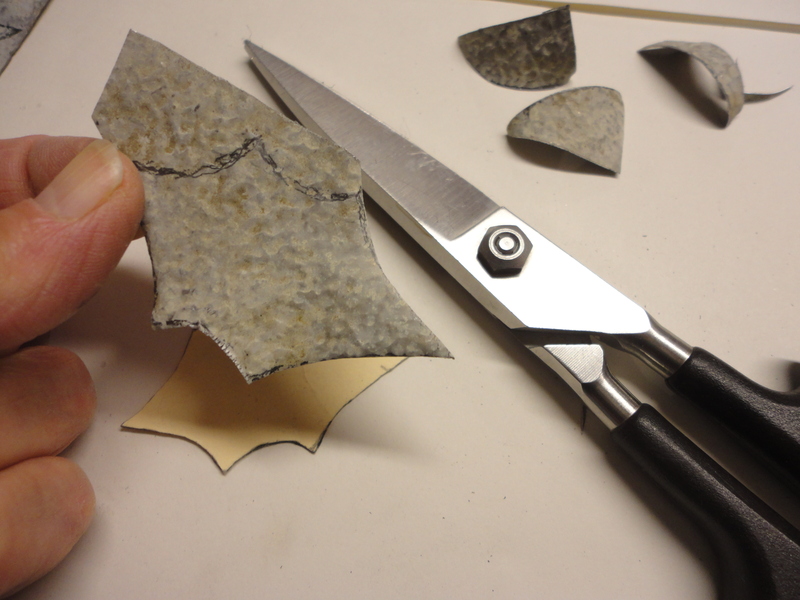 Cut them out with tin snips or all purpose scissors. Be Careful Please … edges may be sharp! 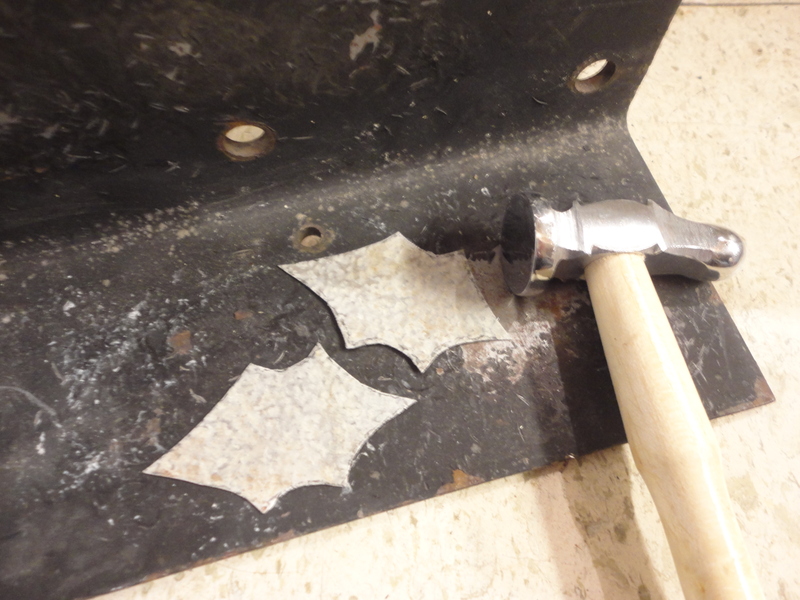 Re-flatten the leaves and punch a small hole for a wire. 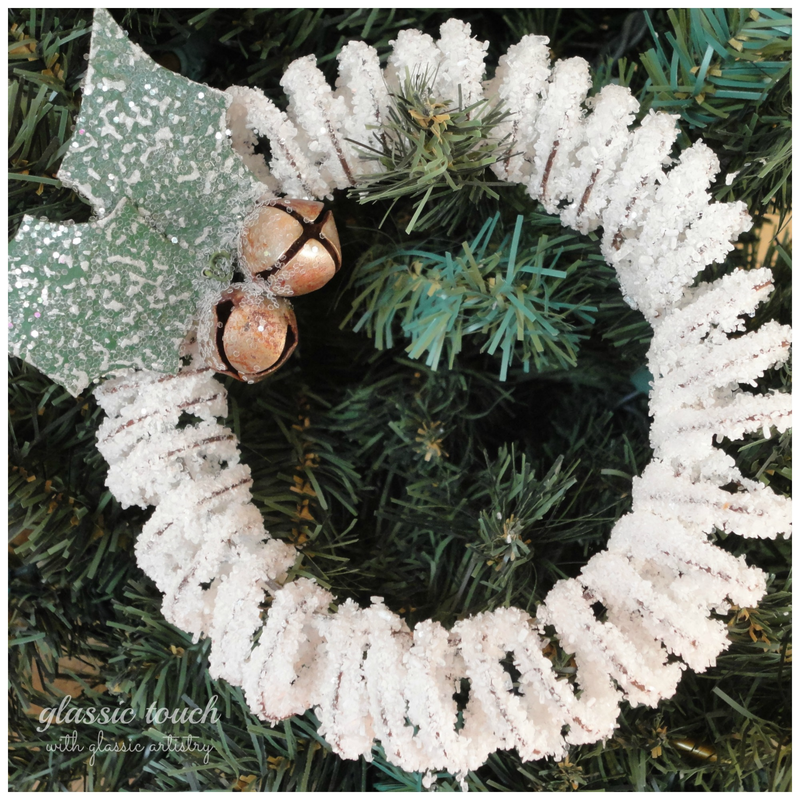 File the edges, sand with steel wool, and paint them with a Christmas green craft paint. Sandpaper the leaves to distress the green paint. 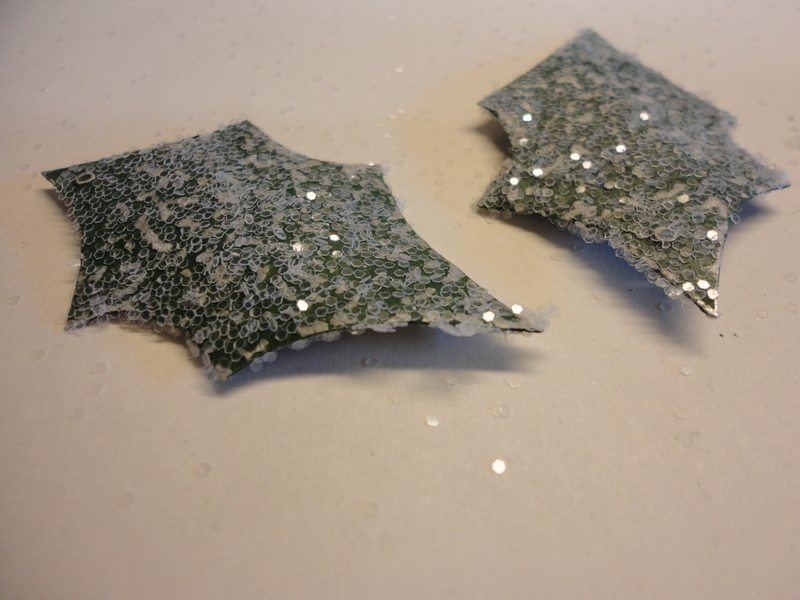 Spray lightly with adhesive and coat them lightly with glitter. 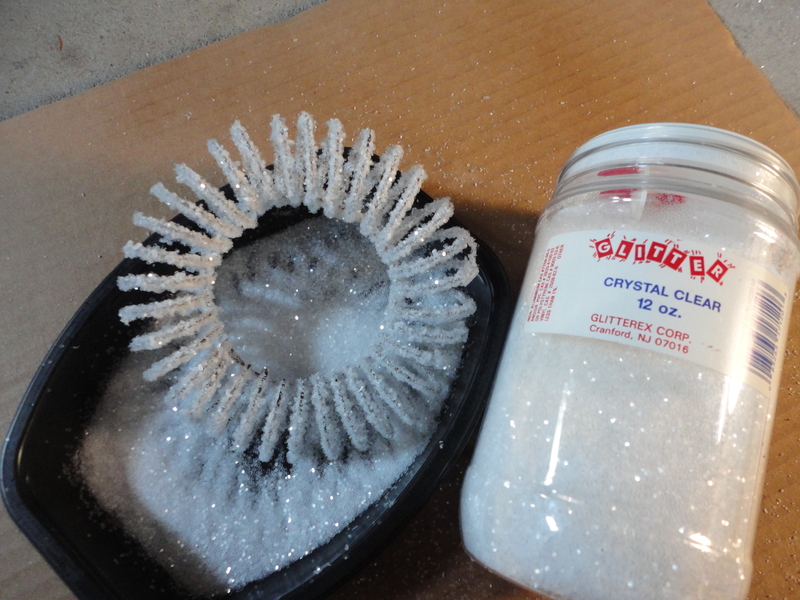 If the glitter gets too heavy, brush it off with a soft bristled brush. 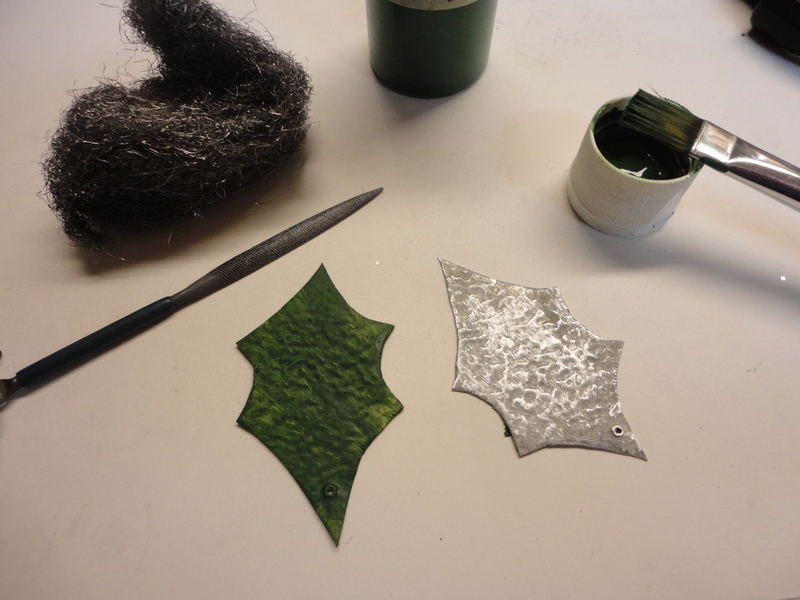 Let dry well before using your fingers to curve the tips of the leaves, to add dimension. 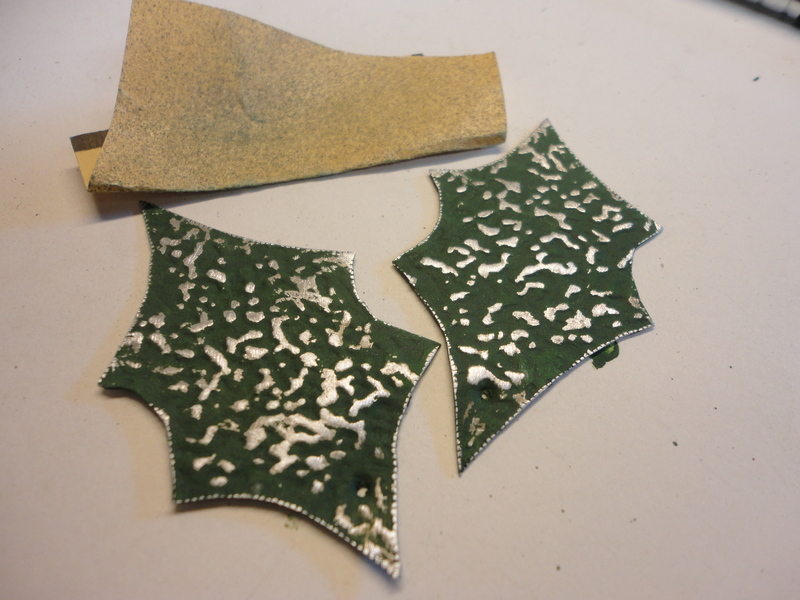 Many small gauge wires will work for the leaves and bells. 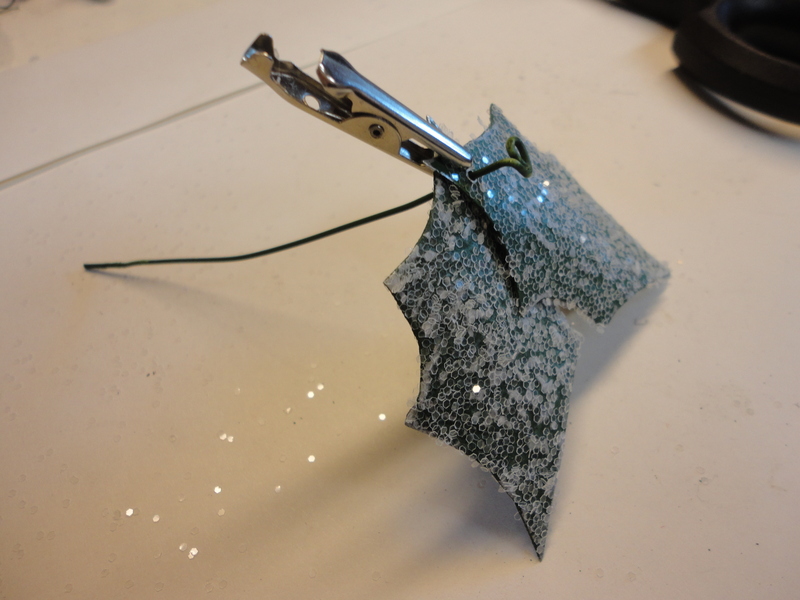 I used Christmas hook wires because they were on my workbench and easily accessible. 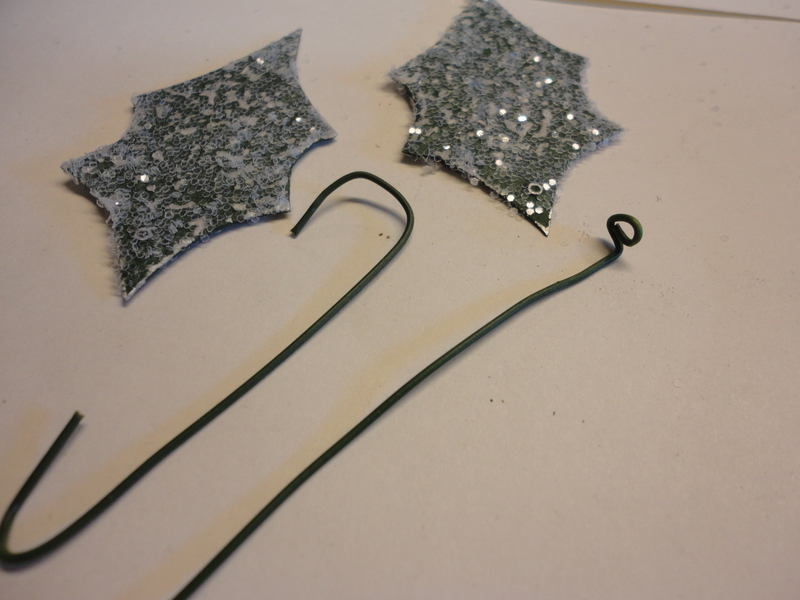 Form a small circle on the end of a straightened, long green plastic coated Christmas hook. Bend it to the side. 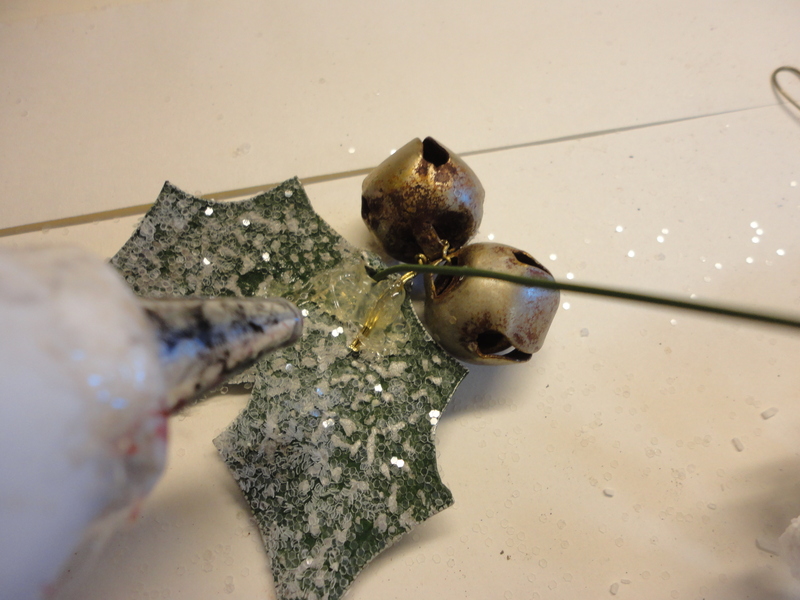 Over lap the ends of the holly, lining up the holes, and clip them together. Insert the shaped wire. Squeeze a little E6000 in the gap, where they meet, on the backside. Let dry. 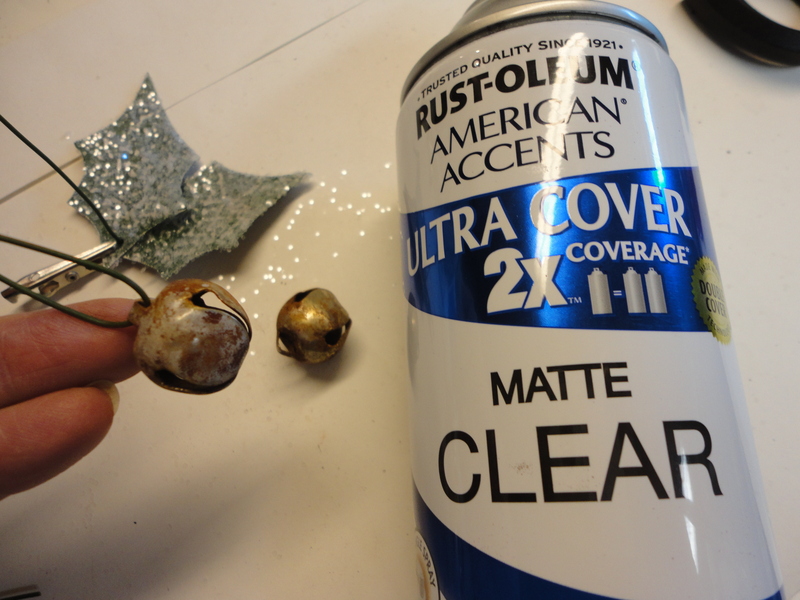 Spray two 3/4″ rusted round bells with a clear sealer. Wire them tightly together. Hold leaves and position the bells as you view them from the front. 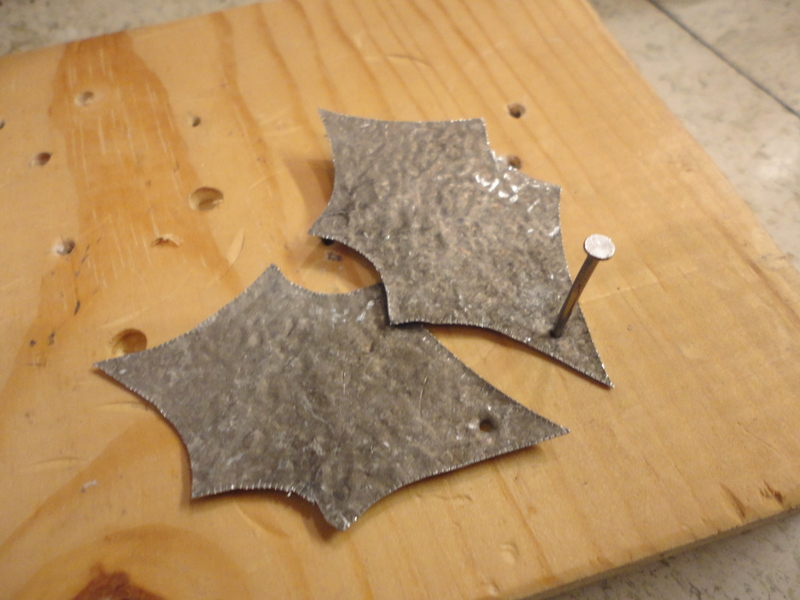 Hold in place and hot glue them enough to hold them in place on the backside of the leaves. Lay them down to secure with more glue. 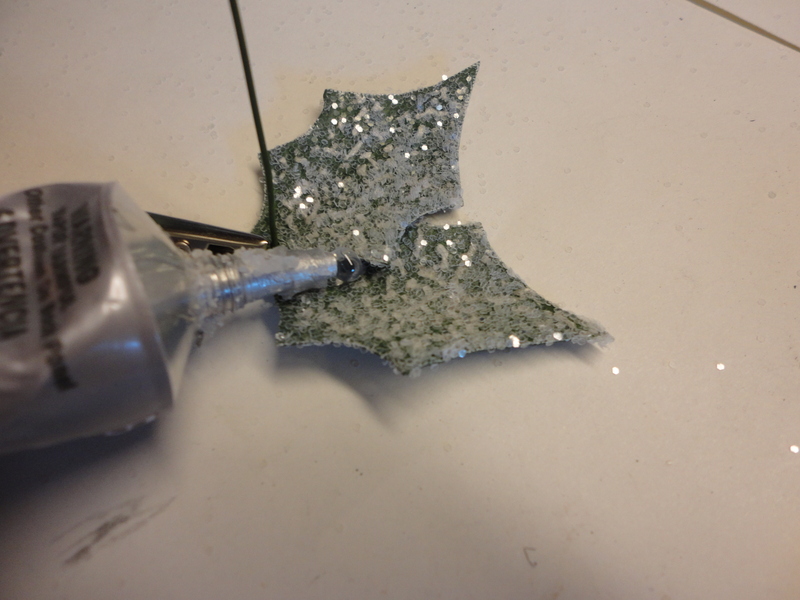 If there is a lot of adhesive and glitter on the leaves, you may need to lightly sand the area before gluing. 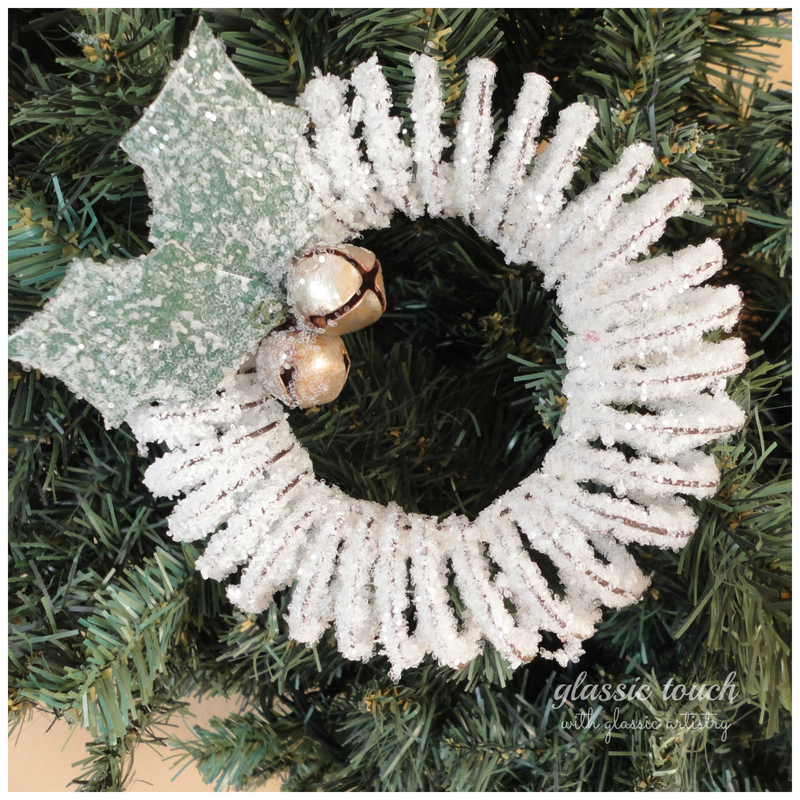 Push the long leaf wire through the coils of your wreath, from the front, covering the spiral connection. 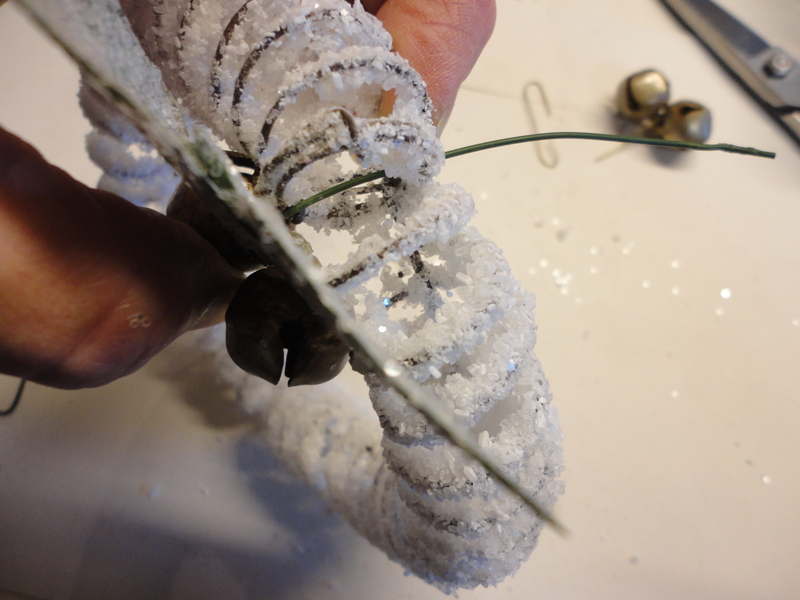 Keep leaves firmly positioned while wrapping the long wire around the inner circle wire and coils. 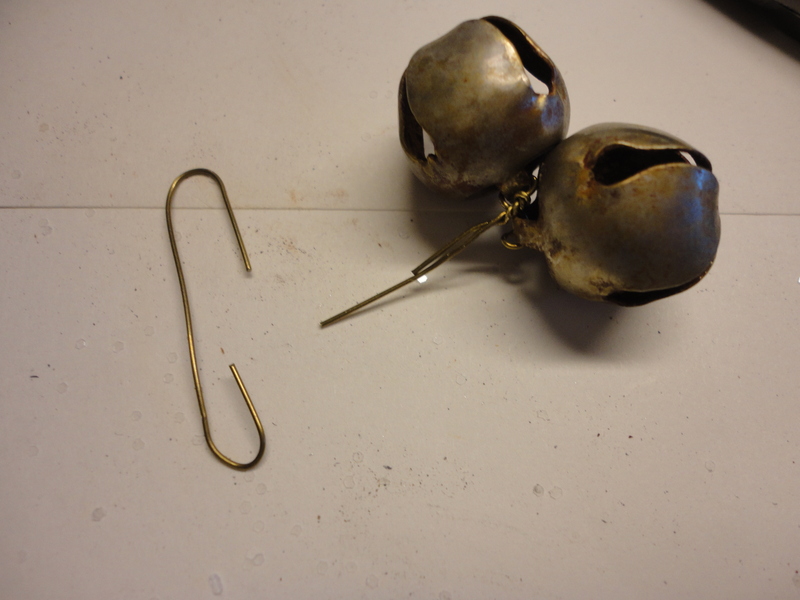 Use small pliers to help thread it through the coils and keep it pulled tight. Do any additional shaping on your leaves. 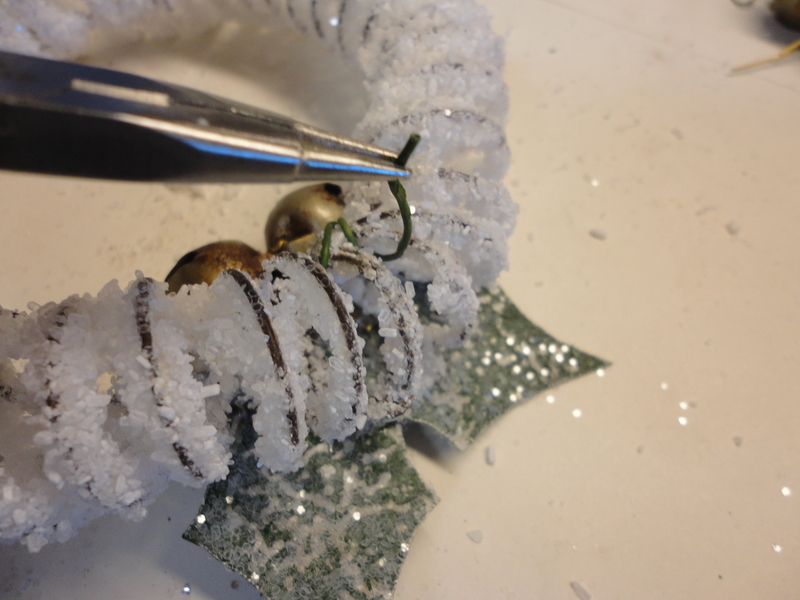 As a finishing touch, give the crown of the bells a quick spritz of adhesive and a little sprinkle of glitter. Hope this little project has inspired some Christmas crafting. If you’re willing to share, I’d love to hear how you are using Epsom Salt in your creations. 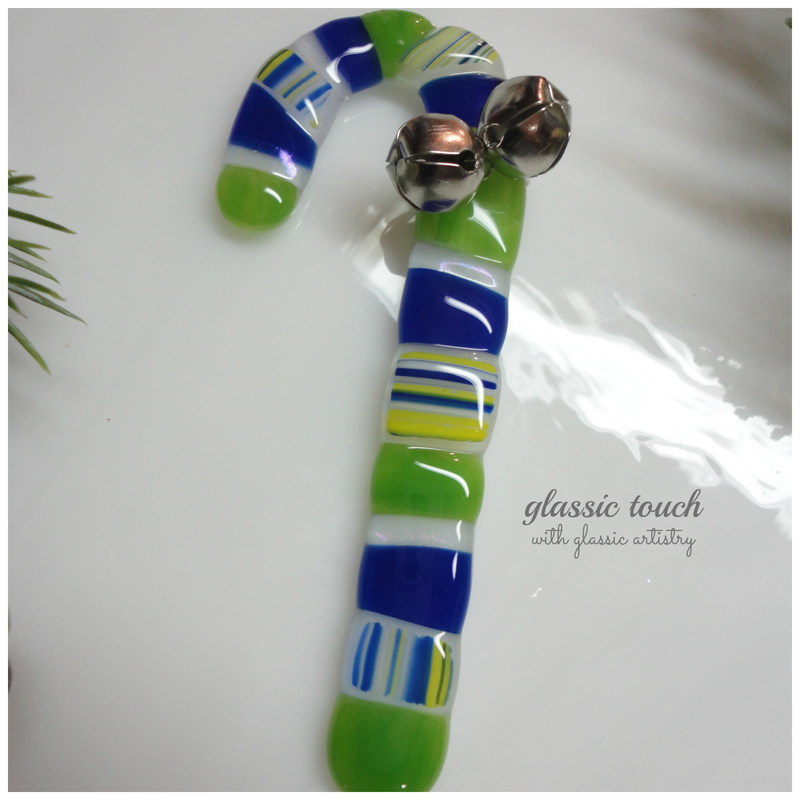 Thanks for visiting glassic touch! A Little Something For Fall! Thank You! Looks like you’re making wonderful things at the paper baker too!